Goats are interesting animals. Not only were they the first animals to be tamed by humans – about 9,000 years ago – but they are also delicious. Goat is the most consumed meat per capita worldwide. They also make great pets. 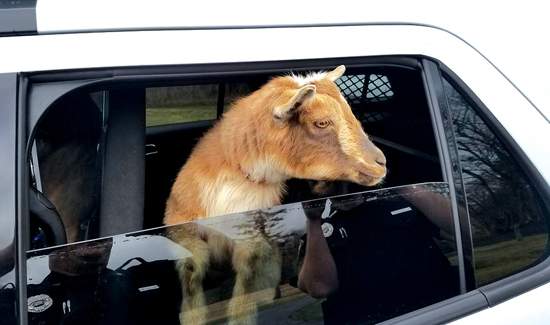 And in Maine recently, police recently nabbed two adorable intruders when miniature goats escaped from their home and started wandering around the town of Belfast. A Belfast police officer responded to a call of goats in a woman’s garage. The pair had apparently smelled some cat food that was being storied in the garage and were found chomping away. Quick-thinking Officer Daniel Fitzpatrick used a cat leash and managed to get them into the cruiser. The cop and his two new pals drove around looking for the goats’ owner as Fitzpatrick kept them calm and happy with some carrots and celery. The daughter of the goats’ owner saw Fitzpatrick’s Facebook post and came down and got them. Fitzpatrick called the runaways “good company” and joked about adding patrol goats to the next police budget.